How do you apply the appropriate filesystem permissions? How do you use TLS/SSL for connections, and are they good for replication? Ronald: My first introduction to relational theory and databases was with the writings of C.J. Date and Michael Stonebraker while using the Ingres RDBMS in 1988. For 28 years, my industry experience in the database field has covered a number of relational and non-relational products, including MySQL – which I started using at my first startup in 1999. For the last 17 years, I have enjoyed contributing to the MySQL ecosystem in many ways. I’ve consulted with hundreds of organizations, both small and large, that rely on MySQL to deliver strategic value to their business customers. I have given over 130 presentations in the past ten years across six continents and published a number of books and blog articles from my experiences with MySQL and open source. I am also the organizer of the MySQL Meetup group in New York City. My goals have always been to help educate the current generation of software engineers to appreciate, use and maximize the right product for the job. I always hope that MySQL is the right solution, but recommend other options when it is not. I am presently looking for my next opportunity to help organizations develop a strategic and robust data infrastructure that ensures business continuity for growing needs – ensuring a reliable and consistent user experience. Percona: Your talk is called “Securing your MySQL/MariaDB data.” Why is securing your database important, and what are the real-world ramifications for a database security breach? Ronald: We secure the belongings in our home, we secure the passengers in our car, we secure the possessions we carry on us. Data is a valuable asset for many organizations, and for some it is the only asset of value for continued operation. Should such important business information not have the same value as people or possessions? Within any industry, you want to be the disruptor and not the disrupted. The press coverage on any alleged or actual data breach generally leads to a loss of customer confidence. This in turn can directly affect your present and future business viability – enabling competitors to take advantage of the situation. Data security should be as important as data recovery and system performance. Today we hear about data breaches on a weekly basis – everything from government departments to large retail stores. We often do not hear of the data breaches that can occur with smaller organizations, who also have your information: your local medical provider, or a school or university that holds your personal information. A data breach can be much more impactful than data loss. It can be harder to detect and assess the long-term impact of a security breach because there might be unauthorized access over a longer time period. Often there are insufficient audit trails and logs to validate the impact of any security breach. Inadequate access controls can also lead to unauthorized data access both internally and externally. Many organizations fail to manage risk by not providing a “least privileges required approach” for any access to valuable data by applications or staff. Any recent real-world example highlights the potential of insufficient data security, and therefore the increased risk of your personal information being used illegally. What is your level of confidence about security when you register with a new service and then you receive an email with your login and password in clear text? If your password is not secure, your personal data is also not secure and now it’s almost impossible for your address, phone number and other information to be permanently removed from this insecure site. Percona: Are there significant differences between security for on-premise and cloud-based databases? What are they? Ronald: There should be no differences in protecting your data within MySQL regardless of where this is stored. When using a cloud-based database there is the additional need to have a shared responsibility with your cloud provider ensuring their IaaS and provided services have adequate trust and verification. For example, you need to ensure that provisioned disk and memory is adequately zeroed after use, and also ensure that adequate separation exists between hosts and clients on dedicated equipment in a virtualized environment. While many providers state these security and compliance processes, there have been instances where data has not been adequately protected. Just as you may trust an internal department with additional security in the physical and electronic access to the systems that hold your data, you should “trust but verify” your cloud provider’s capacity to protect your data and that these providers continue to assess risk regularly and respond appropriately. Percona: What is changing in database security that keeps you awake at night? What things does the market need to address immediately? Ronald: A discussion with a CTO recently indicated he was worried about how their infrastructure would support high availability: what is the impact of any outage, and how does the organization know if he is prepared enough? Many companies, regardless of their size, are not prepared for either a lack of availability or a security breach. The recent Delta is an example of an availability outage that cost the company many millions of dollars. Data security should be considered with the exact same concern, however it is often the poor cousin to availability. Disaster recovery is a commonly used term for addressing the potential loss of access to data, but there is not a well-known term or common processes for addressing data protection. You monitor the performance of your system for increased load and for slow queries. When did you last monitor the volume of access to secure data to look for unexpected patterns or anomalies? A data breach can be a single SQL statement that is not an expected application traffic pattern. How can you protect your data in this situation? We ask developers to write unit tests to improve code coverage. Does your organization ask developers to write tests to perform SQL injection, or write SQL statements that should not be acceptable to manipulate data and are therefore correctly identified, alerted and actioned? Many organizations run load and volume testing regularly, but few organizations run security drills as regularly. As organizations continue to address the growing data needs in the digital age, ongoing education and awareness are very important. There is often very little information in the MySQL ecosystem about validating data security, determining what is applicable security monitoring, and what is the validation and verification of authorized and unauthorized data access. What also needs to be addressed is the use (and abuse) of available security in current and prior MySQL versions. The key advancements in MySQL 5.6 and MySQL 5.7, combined with a lack of a migration path for organizations, is a sign that ongoing security improvements are not considered as important as other features. Ronald: Percona Live Europe is a chance for all attendees, including myself, to see, hear and share in the wide industry use of MySQL today (and the possibilities tomorrow). With eight sessions per time slot, I often wish for the ability to be in multiple places at once! Of particular interest to myself are new features that drive innovation of the product, such as MySQL group replication. I am also following efforts related to deploying your application stack in containers using Docker. Solving the state and persistence needs of a database is very different to providing application micro-services. I hope to get a better appreciation for finding a balance between the use of containers, VMs and dedicated hardware in a MySQL stack that promotes accelerated development, performance, business continuity and security. You can read more about Ronald and his thoughts on database security at ronaldbradford.com. Want to find out more about Ronald, MySQL/MariaDB and security? 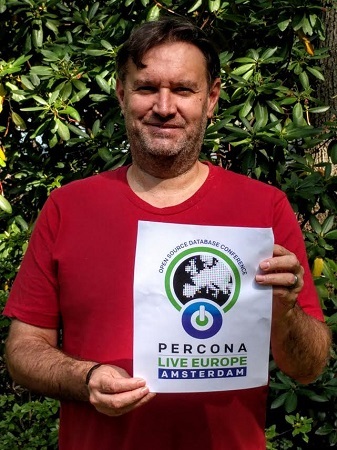 Register for Percona Live Europe 2016, and come see his talk Securing your MySQL/MariaDB data.